Good morning all! 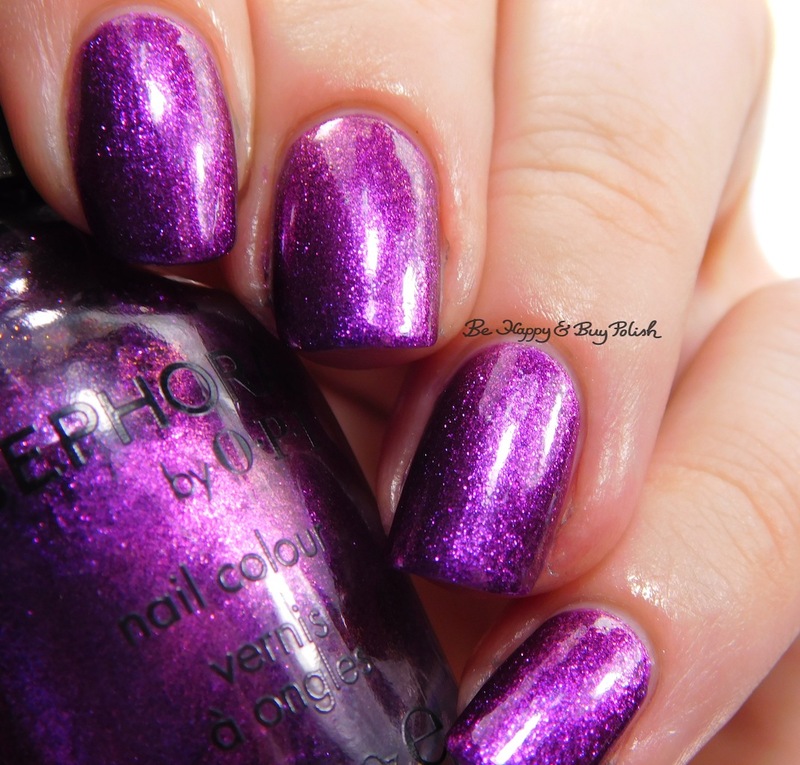 Today I have two Sephora by OPI polishes to show you: If You’ve Got It Haunt It, and Spark-tacular. Both I picked up on clearance at Big Lots like…ages ago. If You’ve Got It Haunt It is a black based nail polish with iridescent glitters and silver flecks. This is sheer and dries gritty. This is 3 thin coats plus top coat. Spark-tacular is a clear based glitter topper with glitters of silver, orange, green, pink, and blue. 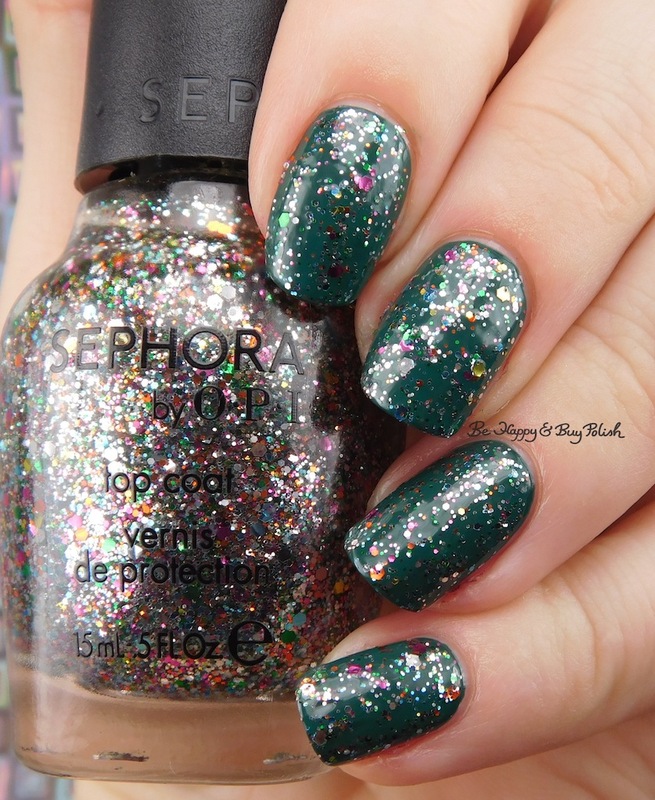 This is base heavy but has a good spread of glitters. This is 1 coat and no top coat over OPI Stay Off My Lawn!! I dunno, I expected IYGIHI to be way prettier based on the bottle, so I’m a little disappointed. Afternoon all! This post published this morning with nothing to show for it. Oops. That seems to be happening a lot lately but I gotta tell you, having a baby that gets me up all hours of the night, plus a toddler and 2 older kids that get up early in the morning – man, it’s freaking exhausting! This is why God created coffee. 😛 Anyway, how about I finally show you Baroness X Fire Opal over Sephora by OPI What Film Noir You In? Hi everyone! 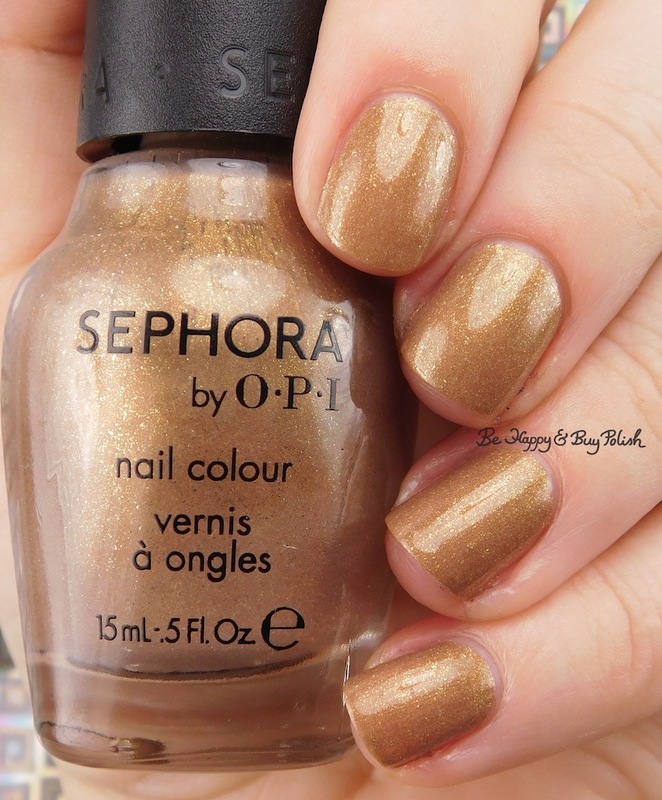 Today I have another older polish from the Sephora by OPI line – I Only Shop Vintage. I believe I picked this up from Big Lots a long time ago. It’s one of those pretty/ugly colors that you either love or hate so hang on and check out the photos! I Only Shop Vintage is a camel-toned (haha, I almost typed camel toed!) base polish with gold and green flecks. Formula was thin and it applied sheer. That being said, This is 2 coats plus top coat. 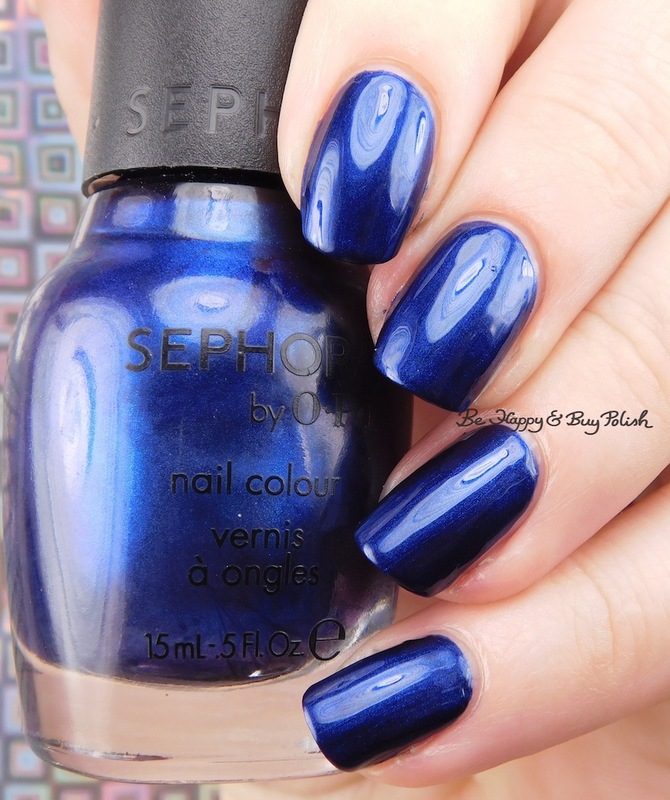 I ain’t gonna lie, I’m on the love spectrum for this polish! It’s weird but Deborah from Love.Varnish turned me onto pretty/ugly colors and I’ve kinda developed an obsession with them! 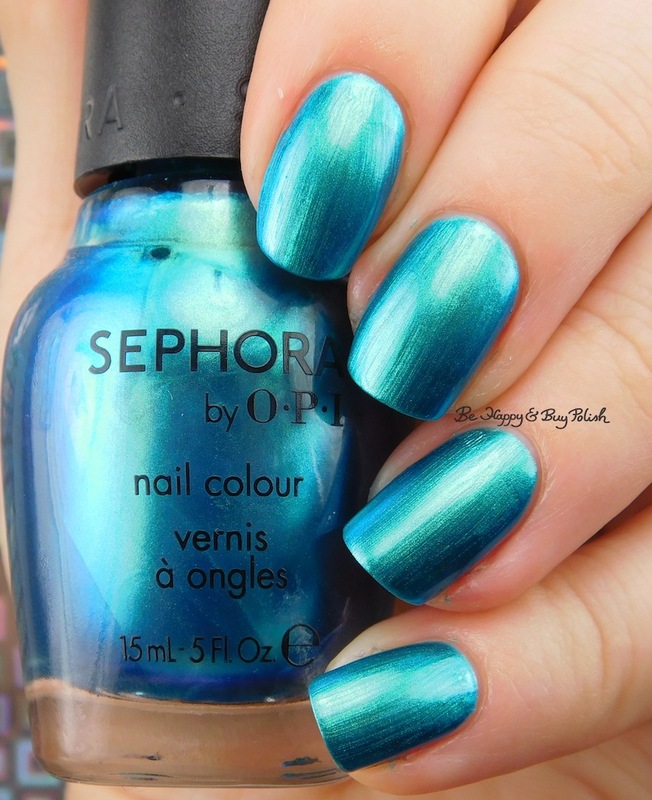 What’s your favorite pretty/ugly nail polish color? So this was originally going to be my Valentine’s Day post but after I wrote up the post and scheduled it, it literally disappeared into the ether. 😦 Which made me super frustrated and angry. So I decided to just show it to you at a later date! Let’s check out this soft and sweet gradient with Celestial Cosmetics LE May 2016, Lilypad Lacquer Nice As Spice, Sephora by OPI Ruby Without a Cause, and The Don Deeva Varnish Pony on Acid [gift]. Posted in 12 Days of Xmas Manis Challenge, challenge, Mainstream Polish, Manicures, Nail Art	by Jessica W.
Good afternoon, beautiful reader! I’m so excited about today’s prompt for the 12 Days of Christmas Nail Art Challenge, so let’s jump right in. 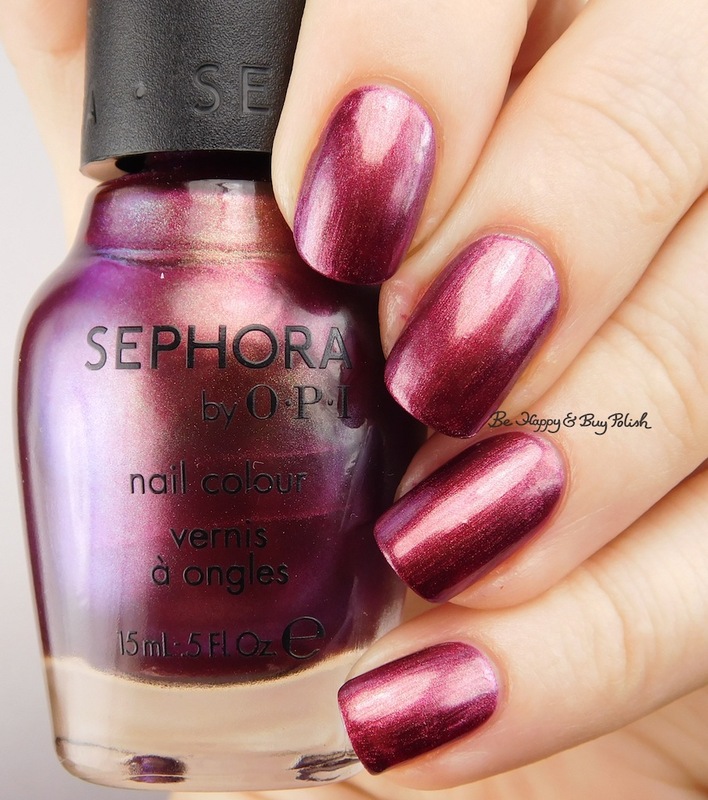 I then placed striping tape on each nail and painted Sephora by OPI Frankly I Don’t Give A-dam over My Turn. Then using admittedly a lot of other Sinful Colors nail polishes that I didn’t bother to write down, I created Rudolph, and some bows. I can’t wait for you to tell me what you think of this, so holler at me in the comments below!